Two of my cute friend’s got married on Saturday and the bride asked if we would make the wedding cake and a groom’s cake too. 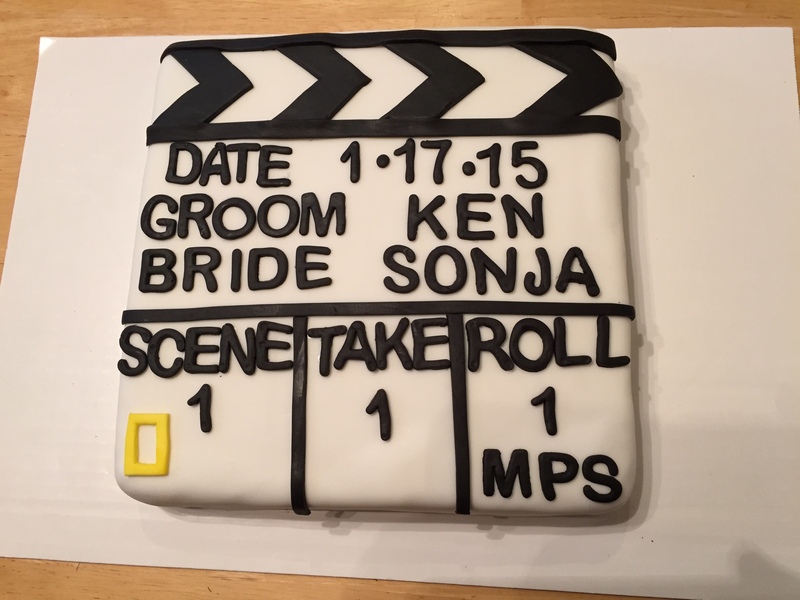 Since I work with them both in the movie biz, we decided to do a slate cake for the groom’s cake. The groom used to work for Nat Geo and now works for the LDS MPS and the bride wanted to include that on the groom’s cake, also the groom doesn’t like cake (who doesn’t like cake?) so we made a rice krispie treat cake for him instead. I used my 12″ square cake pan, sprayed it really well with cooking spray and then made 2 batches of rice krispie treats and pressed them into the pan as tightly as possible. I let it sit for a good long while before I turned it out of the pan and then let it sit for another stretch so that it would harden up just slightly. We frosted the rice krispie treat “cake” with our favorite buttercream icing then covered it with Wilton white fondant. We were both surprised at how smoothly the rice krispie treat cake came out. We used Duff’s black fondant for the decorations except the for the Nat Geo logo which was made from the Wilton white fondant dyed yellow. Congrats to my dear friends Sonja and Ken! Congrats to the lucky couple, & well done on the fun groom’s cake!